Just Romantic Suspense: What was the first novel you read? What was the first novel you read? Congratulations to "Laura", the winner in Julie's giveaway. Thank you to all who participated! I was recently asked by my editor to write a post about the first novel I remembered reading. I’m sharing a version of that post here. My first novel? To be honest, this is a really hard question for me because I was such a voracious reader growing up. 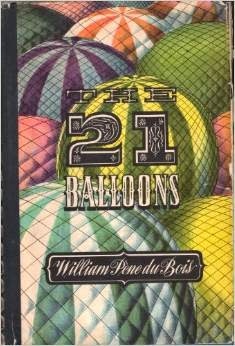 Could it be THE TWENTY-ONE BALLOONS by William Pene DuBois? CHARLOTTE’S WEB by E.B. White? Maybe THE PHANTOM TOLLBOOTH by Norman Juster or KING OF THE WIND by Marguerite Henry? All those books and more blend together in my memories, and it’s hard to remember what was truly the first chapter book I read. But boy, do I remember reading. We moved around a lot when I was a child (Dad was a Marine), and being terribly shy to begin with, I often entertained myself by reading books and making up stories in my head. I don’t ever remember being bored as a child, however. Eventually I would make friends—but reading was always my escape when the stress of trying to connect with someone new got to be too much, or when my big brother and his friends said they no longer needed a spy to play “army” with them (I couldn’t make the machine gun and explosion sounds, so I had to be the spy ;). I would retreat to my room or a makeshift fort made of chairs and blankets, and open a book. Any adventure I might be missing out on didn’t matter. With a good story, I lived thousands of adventures in my head. My mom, being a teacher and a really smart lady who was probably way ahead of her time in dealing with the psychology of a shy child, always took me to the local library when we got to a new town, and my first friends were the new books I discovered there. I also loved ordering Scholastic Books at school (anyone else remember those order forms?). Even when money was tight, she and Dad let me buy at least one book. And when it arrived and the teacher gave it to me, it felt like a birthday or Christmas. Books were a big part of my growing up—and still are. Like the books I write now for Harlequin Intrigue and NOIR, I was always drawn to romance and adventure. When I moved to Fulton, Missouri, the librarian introduced me to a wall of fairy tales and folk tales. And I read every last one. Many, more than once. 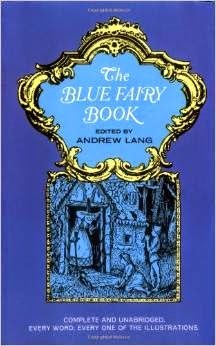 I particularly liked Andrew Lang’s collections called The Blue Fairy Book, The Red Fairy Book, and so on. In those pages, I was introduced to Beauty & the Beast, The Snow Queen, Rumplestiltskin and more. And those are themes I still incorporate into my modern tales of romantic suspense, such as BEAUTY AND THE BADGE or ASSUMED IDENTITY, where a “beastly” cop with no hope for love meets up with a kind, brave woman who sees the noble hero inside him and falls in love with the real man the rest of the world might not see. My November NOIR book, titled BAD GIRL, is Beauty and the Beast in reverse—it’s my heroine, Doreen Riley, who has trouble seeing the good inside her. One of the things readers say they love best about my Precinct books is the community of characters who appear in the different stories. In my August 2014 release, KCPD PROTECTOR, my hero, George Madigan is the deputy commissioner—the man in charge of all the precincts. He’s not the only cop in his family, either, so naturally, it made sense to populate George’s story with several familiar faces from previous Precinct stories—the detectives he orders to help protect his executive assistant when a stalker threatens her. Of course, he takes the front line. Who else would he entrust the safety of the most important woman in his life to? But it’s that team of detectives and CSIs and uniformed officers backing him up who help him get the job done. And, in KCPD PROTECTOR, I take that sense of community to the extreme when a tornado strikes KCPD headquarters. Has anyone seen a disaster movie? All kinds of stars show up in those—and many familiar characters from other Precinct books show up in this one, too. 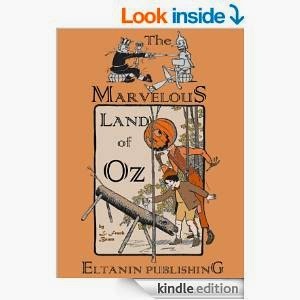 I think I got that first taste of a community of characters working together to complete a journey or reach a goal in the Oz series of books by L. Frank Baum. Yes—series. Many people have read THE WONDERFUL WIZARD OF OZ, but there is more than one grand adventure that takes place over the rainbow. Another favorite involves a boy named Tip, Jack Pumpkinhead and a flying sofa. That’s THE MARVELOUS LAND OF OZ. And guess what, just like in my Precinct books, a couple of favorite characters make an appearance in the story—Scarecrow and the Tin Woodsman. The Oz books truly spoke to my imagination, and to the characterizations and conflicts I use in my own writing today. Probably my first crush, even in second grade, was the Scarecrow in THE WONDERFUL WIZARD OF OZ. I guess I knew from a young age that I admired men of intelligence and loyalty and heart—those heroes who are going to do the right thing and try their hardest and help the people they care about, even when the journey is fraught with magical creatures and wicked witches. Doesn’t that sound like a gritty Harlequin Intrigue? Just substitute heroic cops for Dorothy and her friends, and stalkers, serial killers and rapists for lions, tigers and bears. Like the friends in the Oz books, I love when a character discovers a special talent or takes a personal risk or displays intense loyalty and courage. A lot of the heroes and heroines in my books make those discoveries about themselves and rise to the occasion when necessary, too. I can’t choose just one first novel. But I’m grateful for my imagination and my mom and all the wonderful authors who made it so easy to fall in love with books! What was the first novel you read? Do you remember those first chapter books that made an impression on you? 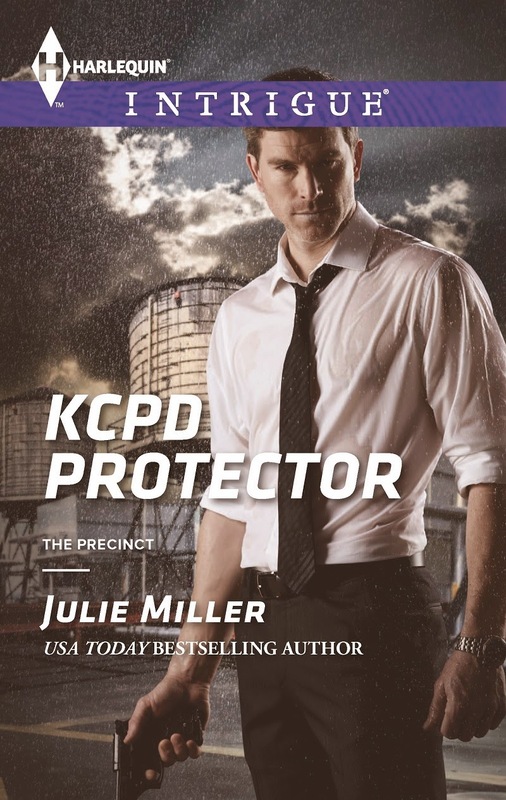 I’ll give away a copy of one of my books, a backlist title or my brand new release, KCPD PROTECTOR—print or digital format, winner’s choice—to one lucky poster! I know, if you're a reader, it's hard to remember that very first book, isn't it? I'm working on getting copies of some of my favorite early books. I managed to keep or reclaim a few, but a lot of them I put in garage sales or donated to schools and women's shelters, etc. But now I'm feeling sentimental and am anxious to have copies of some of my faves again. Interesting. My mom got me hooked on Robert Ludlum in high school. I loved THE ROAD TO GANDOLFO. (I think that's it--where the pope and a pauper switch places) That's also when I started my quest to read all of Agatha Christie's books! I've gotten through quite a few over the years, but certainly have a ways to go. It IS hard, isn't it? I remember thinking through a ton of books I remember reading when my editor asked me the question. Lots of Scholastic books through school orders. Lots of library books. I remember children's books I loved, but that first chapter book or novel? Definitely a challenge. So I ball-parked it with my answer by talking about several books I remember. Wow first chapter book I ever read. That is a hard question. I remember reading The Boxcar Children, Nancy Drew and the Babysitter's Little Sister series when I was young. I also read the The Little House in the Prairie books by Laura Ingalls Wilder. My mother named me after Laura because she enjoyed the tv series. So since I enjoyed to read my grandmother got me the series for my birthday when I was in the third grade. So I would say they were probably some of my first chapter books. I, too was a voracious reader, haunting the local library until the librarian was having trouble finding books suitable for my age. I remember reading books about famous people as children. Loved those books as well as the Black Beauty books. Looking forward to reading your latest! The library was always a favorite place of mine, Lilsis. When we moved to my new school in 4th grade, I discovered a section of biographies that I read and loved--all of them! Can't remember the name of the series that published them, but some of my favorite bios were the Ringling Bros., Helen Keller, Alexander Graham Bell and the Marx Brothers. Libraries rock again! I love seeing how many of us loved libraries growing up. I'll confess, I never read ANNE OF GREEN GABLES until I was an adult (late 20s?). I saw the miniseries on tv (PBS, perhaps?) and fell in love. Went and found the books and read them then. I dont know the first book I read but I used to go with my Dad to the comic book store and I read a lot of THE ARCHIES!!! I know I read some of my Mom's TRUE STORY magazine's with out her knowing! The a few year's ago I somehow still had my books from way back. I'm talking Lassie, The Munsters, and one I must have given to Doug's sister to read that I never did. The funny part of it is I don't remember buying it or giving it to her. Doug's Dad gave us this old box of books and there it laid! I had no memory of it. I opened it and there was MY OWN HANDWRITING! I had my name in it!! I still have yet to read it. I know the first Silhoutte Desire book I read was Baby Dreams. It was about a young woman who had a dream catcher and had a "dream" about a native American........ then I had three by Cassie Edwards that I read next. That began me reading all of Cassie's books and picking up Desire's! Jenny , however, got me into reading your's about 2-3 yrs ago with Man with Muscle!!! I went through a big comic book phase, too! About 5th? 6th? grade. My brother and I would walk downtown to the dimestore (pre- WalMart era) and buy candy and comics. I loved Marvel's heroes (my son thinks I'm pretty cool now because I read X-Men comics! ): X-Men, Fantastic 4 (again, I was drawn to that "team" of heroes theme). But I read a lot of Archies, too. ;) And cool that your own gift came back to you! I understand that Alex Taylor hooked a lot of readers on my Precinct books and Intrigue. Thanks, Pam! Too many years & books ago to really remember. I grew up in a household full of books. I know. It was practically impossible for me to remember my first novel. I could recall several early ones--and children's books before that (Little Bear, Encyclopedia Brown, Dr. Seuss and more), but that FIRST novel? No way could I pick the exact first title. It was Black Beauty. The book gave me my first love of horses. Interesting how Black Beauty is showing up on a lot of First lists! :) I didn't read that until a little later. But I fell in love with horses reading Marguerite Henry's KING OF THE WIND. Then on to MISTY OF CHINCOTEAGUE, JUSTIN MORGAN HAD A HORSE, etc. I'm not sure which was my first novel, I remember the Box Car Children, The Bobbsy Twins, and Five Little Peppers. But the first one that fired my imagination was "A Wrinkle in Time" by Madeleine L'Engle. That one started my love of science fiction and fantasy. I have read many Agatha Christie's, but I love to read Rex Stout's Nero Wolfe in order. I love his view of American life and watch it change as the stories progress from the mid 30s to the 60s and even 70s, I think. Interesting about reading Nero Wolfe in order and getting a bit of a history/culture lesson. I love discovering stuff like that when I read.